Parc de Witte Vennen not only offers plenty of activities. There is also accommodation in all shapes and sizes. The basic, but nicely furnished detached Scandinavian chalets (NL-5807-01) are suitable for two adults and three children. They are situated by the edge of a forest and near a large lake. They have a terrace in the front as well as at the back. 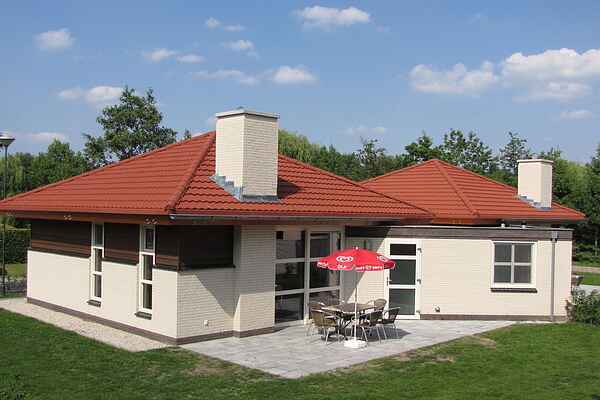 The modern furnished Park houses (NL-5807-02) were completed in 2014 and are suitable for six-pers. The location is ideal for young families; not immediately by, but near the water and other facilities. The four-pers. Bank houses (NL-5807-03) are similar, but are situated directly by the water. Both types have their own bathroom with (walk-in) shower, bath, and a fully equipped kitchen with, among others, a dishwasher and a living room with fireplace. Naturally, each type of accommodation has its own spacious garden with garden furniture.